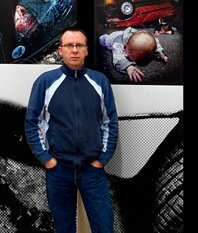 This exhibition is by Paul Wenham-Clarke who is a working advertising/commercial photographer. He is has won many major awards in the past for his commercial work but decided to undertake an MA at Nottingham Trent University so he could take on a major personal project. Paul has worked on the project with RoadPeace, a charity that acts as a support group for people bereaved and seriously injured by road traffic incidents and campaigns for safer roads.